As we did last year, we’re going to be posting our annual self-evaluation and plan as a series of blog posts. Our self-evaluation starts with a set of critical questions about GiveWell, intended to examine how well we’re accomplishing our high-level goals. For the most part, our high-level goals are the same as they were last year, and thus our questions for GiveWell are the same as the questions we laid out last year. However, there is one major change in how we see the goals of GiveWell: we no longer assign high importance to the number of causes covered / number of options we provide to donors. Instead, we just want to focus on finding outstanding charities that donors can be confident in, and closing those charities’ funding gaps to the extent that we can. Groups that rate as many charities as possible. Donors come to them already having a particular charity in mind to give to, and search for that charity. Groups that suggest charities for as many causes as possible. Donors come to them knowing what sort of cause they want to support (U.S. education, global health, etc.) but not which charity, and get a recommendation. Groups that simply focus on finding outstanding charities. Donors come to them looking for outstanding giving opportunities (they are often issue-agnostic). We started GiveWell as issue-agnostic donors looking for the best giving opportunities we could find, and we have always primarily been interested in #3. We’ve never had a serious interest in #1 above – distinguishing between “worst,” “bad,” “good,” and “better” is too much of a distraction when what we care about is “best.” But for most of our history, we’ve seen ourselves as possibly being on a trajectory toward becoming #2 in addition to #3. We’ve talked about covering a broad array of causes to interest as many donors as possible, thus increasing our influence and visibility. Many of those who have criticized us have focused on the small number of causes we’ve covered, and expressed the hope that we will eventually cover many more. 1. We see it as urgent, and difficult, to find more “gold medal” charities than we have so far. Why? Because not only does VillageReach have outstanding evidence of effectiveness; it has outstanding bang-for-the-buck (in absolute terms, not just relative terms) and most importantly, it has a concrete plan for additional funding. We personally don’t like raising money for groups that we can’t say all these things about. We’re happy to provide our recommendations for someone looking for the best microfinance charity, but we can’t honestly say that we think dollars given to it are accomplishing as much good as possible. VillageReach had a “stretch” fundraising target for the year of $1.5 million. That gap has now been more than closed. VillageReach needs a total of $4.4 million for its multi-year project, so we are happy to leave it as our top-rated charity for now, but if our growth continues, the entire expansion could be funded by the end of the year. Thus, we are starting to get dangerously close to the point where the number of dollars we influence exceeds the number of dollars we know how to allocate very effectively. We see this as an urgent situation. It would be a major problem for GiveWell if we essentially had more demand for our research (i.e., donors interested in following our recommendations) than supply (i.e., charities able to absorb this funding effectively). Thus, one of our top priorities for 2011 is finding more “gold medal” charities that we can give a wholehearted recommendation. We feel it would be a major distraction – and mistake – to try to find the “best of the bunch” within causes where there are no groups that really shine by our criteria. 2. The benefits of covering extra causes don’t seem very large. The argument we’d always used for covering more causes was that covering more causes means appealing to more donors. In theory, this is true, but for the specific audience we seem to be attracting, the value of breadth seems surprisingly low. The following charts show the percentage of our 2010 “money moved” (donations given to our recommended charities as a result of our research, which we track in a variety of ways) to different categories of charity. A future post will go into more detail on how we track “money moved” and what the figures were for 2010. 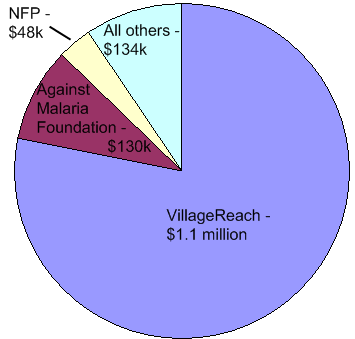 Note that VillageReach is our top-rated charity; Against Malaria Foundation is our only recommended charity that allows donors to get tax deductions in a variety of countries outside the U.S. (Canada, Australia and more); Nurse-Family Partnership (NFP) is our top-rated U.S. charity and was featured in a Nicholas Kristof column (we count donors coming from that column as “money moved” because Mr. Kristof has informed us that he included NFP in the column on our recommendation). Bottom line – it looks like the overwhelming majority of our donors follow our recommendations regarding the promising cause and the most promising organization. And education and microfinance are still pretty broad, popular causes. I’d expect a “cancer research” or “global warming” recommendation to be pretty comparable to education and microfinance in terms of new money moved; I’d expect a narrower cause like “homelessness in New York City” to bring much less. This doesn’t mean that all donors are issue-agnostic or global health fans. It means that our audience is. And we need to focus on serving our audience as well as possible. We plan to maintain/update our existing research on all causes, including the causes above plus disaster relief (the newest addition). We plan to investigate more causes for the purpose of finding more outstanding charities. We will be writing up as much as we can of what we learn in these investigations, which may (along with our do-it-yourself evaluation guide) be helpful to donors interested in particular causes. We may provide donors a way to “lobby us” to cover more causes. I’ve thought about the idea of offering donors the chance to commit to give $X to our top-rated charity in a given cause, conditional on our covering that cause; if we got enough commitments for a given cause we would cover it. However, we no longer consider “number of causes covered” a relevant metric for GiveWell and will be replacing it with “room for money moved,” i.e., the total amount of room for more funding of our very top-rated charities. Some may be disappointed by this decision, seeing it as a retreat from the opportunity to be a resource for as many people as possible. But we’re not sure how much sense it really makes for an operation like ours to maximize its breadth. Giving decisions are deeply personal, and the kind of work we do is as well. We’ve mostly followed our personal values in making recommendations, and we’re attracting an audience that seems comfortable with these values. This doesn’t mean that there’s no place for a GiveWell-type operation that focuses on (for example) U.S. causes; but perhaps we aren’t the people to run that operation. Perhaps it takes someone who truly believes that U.S. charities represent the best chance to help people (we do not) to do compelling research and attract the right audience for that cause. We’d be more than happy to see such a group spring up. For our part, we’re happy to remain a niche operation for a niche audience, as long as the niche is big enough. And it appears to be growing. I somewhat question the notion that ” And we need to focus on serving our audience as well as possible.”. I’d say you need to focus on doing the most good possible, your audience is largely self selected anyway. If 1/2 your potential audience were really interested in hearing about good MakeAWish-like foundations, I still don’t think you should spend much energy on such charities. I suppose it’s moot anyway because your audience seems to have come up with the correct answer anyway. I do like “room for money moved” as a metric. Based on what I’ve seen of where donors are coming from, I think that GiveWell adopting a focus on serving issue agnostic donors (at least in the short term) is very sensible. one of our top priorities for 2011 is finding more “gold medal” charities that we can give a wholehearted recommendation. Aside from the (primary) issue of room for more funding, I also share some of the queasiness that I read to be implicit in a comment by Vipul about GiveWell being overly closely associated with a single small recommended charity. Having looked carefully at the reviews of most of GiveWell’s recommended charities I think that highlighting VillageReach over others that GiveWell has looked at is entirely appropriate. In particular, when I looked carefully over GiveWell’s most recent review of StopTB Partnership I was disappointed by how much weaker the case for the marginal donations to the charity seemed to be relative to the case for marginal donations to VillageReach. But it would be great to find more charities of value plausibly comparable to VillageReach at the margin. One natural idea is to take a closer look at the Neglected Tropical Disease charities which you discussed in a previous blog post . I was also happy to see that GiveWell will continue to investigate more causes for the purpose of finding outstanding charities. As I’ve said elsewhere, I think that it’s possible but unclear that global health is the best cause for issue agnostic donors who want to help people as much as possible, so that there’s a tension between issue agnosticism and focus on global health. Completely agree with the new direction. I hope to see GiveWell recommend a charity as good as or better than VillageReach this year. Full disclosure so I understand if you may not want to post this–I work for Landesa (formally Rural Development Institute, RDI). Now that you are expanding your world vision, I would encourage you to look at organizations that are based on scale rather than just $2 price tags. Check our Landesa and the issue of land rights for those living on less than $2 a day and why land ownership or long term leases has made a huge impact on global poverty alleviation. http://www.landesa.org I will mail you a book, One Billion Rising which dives into the research– both successes and challenges. One additional comment. I realize that you support scale as well and that VillageReach is a program with the intention of scaling. Didn’t want to sound like your only measurement was the cost of delivery. On a similar note, I’d really love to see some analysis of global catastrophic risk. Are other people who use your research interested in these less tractable things? It sounds like you are suggesting examining the effectiveness of giving that is basically political (giving to lobbyists). While it is certainly possible, that either at a very high level (Republicans vs. Democrats, or maybe Libertarians, Greens, Socialists or whomever), or at a lower, issue level (size of USAID budget), that one side of the issue dominates some form of analysis (presumably, the “correct” one, given an ethical framework and various priors supported by some group of right-thinking people) to the extent that $1000 given to that political faction dominates $1000 given to VillageReach. 1) Determining which side is correct, and the magnitude of how correct they are (essentially, the positive impact of $1000 given to supporting that side) is a very difficult task. 2) There are already VAST numbers of organizations, websites, and so on that analyze the political landscape, and either try to determine the best views, or advocate for the best views as they see them, or whatnot. Attention devoted to political issues dwarfs that given to effective charity, IMO. 3) Even if GiveWell were to focus on this stuff and somehow determine that political issue X is very important – moreso than VillageReach or other top charities, convincing the public that GiveWell is truly a neutral analyst in this would be challenging, and GiveWell would likely lose credibility in general, and particularly among at least some folks who might otherwise support other things GiveWell is doing (i.e. spotlighting charities that are largely politically-neutral, like VillageReach). 4) In an indirect fashion, GiveWell can contribute to the political issues debate, if it can locate and spotlight effective charities. Over time, if GiveWell is effective, I believe both its general approach (evidence-based), and its specific findings may influence broader aid discussions that often go into policy areas. But its better, IMO, to let this be an indirect effect than to explicitly focus on policy impacts. I largely agree with these claims, especially in the case of very general political action. I largely had in mind very specific policy moves (e.g. using certain standards of effectiveness for a portion of the USAID budget). While this would still be really hard for many of the reasons you give, it would be much easier to do the research, seem neutral, and convince the general public of the merits of the approach than in a much more general case. jsalvatier, my statement about serving our audience well referred to what I think we should do under current circumstances – it was not a statement of our general mission. I agree with you – our goal should be simply to accomplish as much good as possible. Nick, we are interested in less “tractable” causes, and feel more prepared to analyze them now that we’ve gotten our basic bearings doing the “easy analysis” in the nonprofit world. 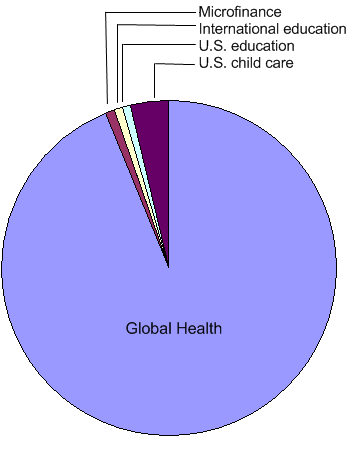 From a benefit-cost perspective, we still have global health work (likely to pay off more quickly in yielding gold-medal charities) higher on our priority list, so I’m not promising that work on less “tractable” causes is imminent, but it is something that we anticipate doing at some point.